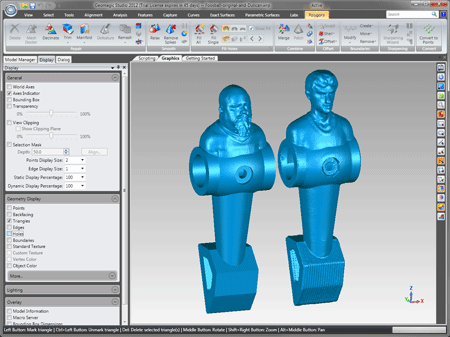 New 3D scanning and 3D printing technologies are allowing us to obliterate old limitations. They’re giving rise to disruptive inventions, unseen production methods and dynamic products. 3D technology is a lot of fun, too. Take foosball. Foosball is fun. Now, the life of a foosball figure isn’t much to write home about. Think about it. In lieu of feet he has a paddle. He’s subjected to all-day spinning on par with any vertigo-inducing amusement park ride, left nauseated and dazed. The free time he does have is spent talking to the other players, who are identical in every way. That is, he can only talk to himself. With millions of people playing foosball in one week, that’s a lot of spinning and a lot of boredom. As makers ourselves, we could at least remedy one of those fates by doing something that we do every day at 3D Systems Geomagic: scanning, faces to be exact. This way we could give the foosball table some needed diversity and cure the boredom. So we set out to make foosball figures out of us, the employees of Geomagic. So we began by scanning every employee in the office. Now, scanning technologies are getting cheaper and more accessible. How accessible you ask? Well, for this project we used a Microsoft Kinectsensor, which, with a freely available toolkit, is a great entry-level option for around $250. Along with Geomagic Spark and Geomagic’s Kinect plug-in, Fuse, our engineers can create a polygon mesh out of the data gathered with the Kinect. One of the first victims honorees for the foosball project was our IT guru, Duncan, who sports a noticeably long goatee and a shaved head. I’ll turn it over to Geomagic Product Manager Kevin Scofield to tell us what he did from there. With a polygon mesh of Duncan already in hand, I created a digital version of the foosball player’s base: the uni-foot (yes, a real foosball term). This was a process of collecting scan and probe data of the uni-foot, and merging it all into a single polygon mesh. In Geomagic Studio I extracted some basic shapes, but I used SpaceClaim (check out the figure below), a direct modeling CAD software, to create the full base CAD model. 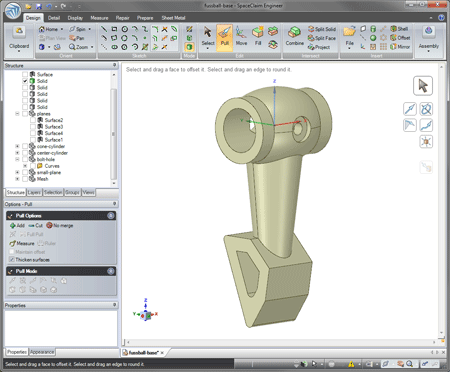 From there I saved out the CAD uni-foot model as an STL, a file format used widely for 3D printing and other computer-aided manufacturing, and brought it back into Geomagic Studio. The final step was to align Duncan’s scanned head with the base I had just designed. A tug of the mesh here, a pull there, and voilà: Duncan was transformed from IT master into to foosball legend. In some instances we transferred the models to Geomagic Freeform, which converts them into voxels, a type of virtual clay. Using a haptic device you can actually touch and sculpt these models. Needless to say, it’s amazing and quite useful for creating features like hair, which is notoriously difficult to capture with a scanner. For Duncan, as with everyone else, we created STLs out of the final model and sent them all away for 3D printing. Our new, customized foosball table is not only cool, but it gives new hope to foosball tables, foosball figures, and the humans who play the game the world ‘round. Here I am, at center striker, surrounded by the amazing Geomagicians that both create our software and produce the amazing things our software can create. 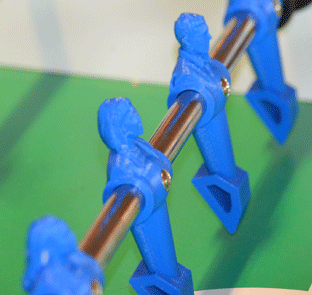 And the Cube printers at our tech lab can make more of the custom foosball men and women. Maybe next we’ll make the table itself, personalize the field, produce custom grips for anyone who wants to play, and on and on. After all, considering our leading-edge technology and resources, there is a new brand of possibility afoot. We can do almost anything. What satisfaction we can now, more than ever, find in creating something from our own minds. There is something wonderful and visceral about using your hands, spurning the giant manufacturing machine that we’ve become so limited by, and seeing a project through from concept to fabrication to action. If typical manufacturing is square, even robotic, then making is characteristically human. And it feels good to be human (even when we’re creating machines). Until next time, happy making. The 3D Alchemist is a spiritual musing and love letter to all things 3D and the wondrous things we make. Hopefully, it’s also a source of inspiration for you, a place from which makers apply their imaginations. Beginning today, it will run the third Thursday of the month. Honored in 2005 by Inc. Magazine as “The Entrepreneur of the Year,” Ping Fu describes herself as an artist and scientist whose chosen expression is business. In 1997 Ping co-founded Geomagic, a 3D imaging software company, which was acquired by 3D Systems in February 2013.